Mount Fuji, or Fujisan in Japanese, has a mythic status. It’s a World Heritage Cultural Site and, in many ways, can be considered as the symbol of Japan. At 12,389 ft, it’s the highest mountain in the country. Located 60 miles south-west of Tokyo, its nearly symmetrical sloping cone is indeed very beautiful. Riding on the Shinkansen, with some luck, you can see it for a couple of minutes as you dart in and out of tunnels. Going towards Osaka from Tokyo, you want to sit on the right. I looked to reserve a right side window seat, but needed to wait over an hour for an opening, so I decided against it. I hit upon the idea of standing by the exit for a few minutes and shooting out the door’s window. With the aid of GPS and the latest smartphone technology, I followed the progress of the super fast train and moved to the exit a few minutes before the optimal point. 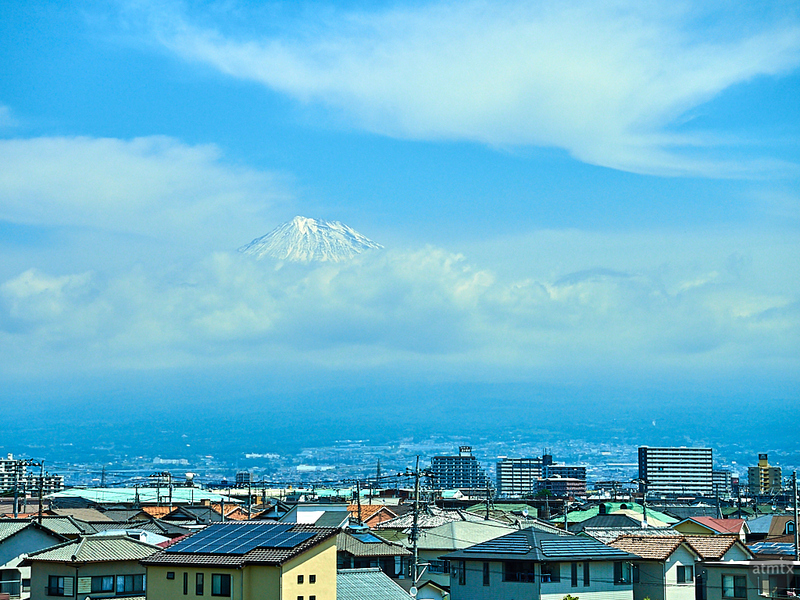 While it was a decently clear day, unfortunately, there were clouds engulfing Fujisan. This was the best the I can manage that day. I later learned that it’s not unusual to have Mount Fuji obscured by clouds and seeing a clear view is actually rare. Some 30 years ago, on a trip back to Tokyo, I was sleeping on the Shinkansen and woke for a brief second to see Fujisan in all its glory — completely clear. It was almost as though the mythical mountain called to wake me up. I didn’t know back then that it was such a treat. I shot this image with the Olympus OM-D E-M5 Mark II with the 12-40mm f2.8 Pro at 40mm (80mm equivalent). I used a 1/2000 per second shutter to stop the action. I never did get a second chance to shoot Mount Fuji. On my return trip back to Tokyo, I traveled at night. This is my favorite view of mountains, with a veil of clouds. Fujisan is on my bucket list. Having the clouds does add some mystery. Hope you get to visit it someday.